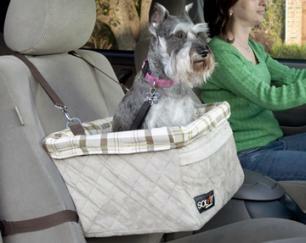 The Solvit Large Tagalong Booster Seat provides the ultimate ride for your pampered pet. Other booster seats sit too low, or they are supported by straps that attach to the front of the basket, making it difficult for pets to see out or move around. Our design supports the seat from below, providing an unobstructed view and more comfortable ride for pets – with no clumsy straps to get in the their way. Installs securely in one minute and even works in the back seat (requires headrests). Recommended for pets up to 18 lbs, such as Dachshund, Lhasa Apso, or Mini Schnauzer. For larger or smaller pets, consider our Medium or Extra Large size, or our Jumbo On-Seat Booster. The Deluxe model (#62346) features a padded & quilted construction, using microfiber and woven plaid fabric liner. The Standard model (#62345) utilizes a polyester oxford and sheepskin fabric combination. The interior liner removes for washing so the seat stays clean and fresh. A zippered, front storage pocket, and safety leash are also included. Overall Product Dims: 16" x 14" x 8" -- Weighs 3 lbs. The Large Booster Seat carries a one year warranty against defects in materials and workmanship.